Styles from: Gingher; Dovo; Wasa; and some French and Italian Importers. We have an entire display case full of the most wonderful Solingen Steel Cutlery from Germany, unusual novelty scissors from France, top quality embroidery scissors from Italy -- just a wonderful array! (I kind of have this "scissor thing," and if you're a collector, you won't want to miss this page, either!) Click the images at right to see our growing scissor pages. We have the PERFECT GIFT... waiting for you! It comes in every color, fits every stitcher, and costs whatever you want it to!!! Our Silver Needle Gift Certificates are offered in any US dollar amount, and come to you printed on a card, with gift envelope. They can be mailed directly to you, or to the lucky receiver... and have no expiration date. Some might think that a little piece of paper might not be the greatest thing to give but EVERY stitcher wants more things for that beloved 'Stash', or a new Vera Bradley bag... or a wonderful new pair of scissors... That special little piece of paper is just the BEST! The bearer can use them for our classes, Camp Wannasew Weekends, and all the cool things we have in the shop and on the website!!! Do keep SN Gift Certificates in mind! They're perfect! Please use the write-in box for your specified dollar amount. If we are sending the certificate to them, on your behalf. There are no shipping fees on certificates, unless they are sent Priority Mail or UPS Overnight, 2nd or 3rd Day Air. Please let us know if there is a sentiment we need to include with it. We will need both your addresses. We will mail you the receipt, and the certificate to your special stitcher! Wow... are we having fun around here with these fun new *Rags!!! 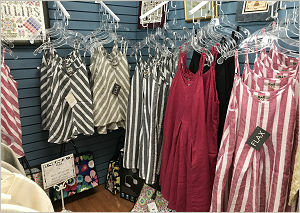 * I've decided to bring in the FLAX line of ladies apparel, because my very favorite boutique closed last year... and I couldn't find my very fav clothes in Tulsa anymore. 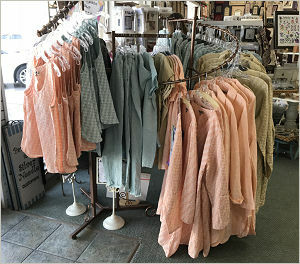 An extensive line of 100% linen... FLAX has been around for something like 25 years -- and I've worn it for 20! Classy and trendy... the collections all feature loose, relaxed, pigment dyed linen and linen/cotton gauze. Very Organic, Very Artzy-Fartzy, Creative and Fun!! Sizes range from petite to really-not-so-petite... and everything looks great on everyone! We've always have several of FLAX's current Collections. Moving around a few fixtures in the shop to make room was kind of fun... you can always find a place for something new you love!!! Three more collections are due in January and early February, so we have lots to look forward to! I couldn't get everything in every size... (yet!)... so check out our FLAX page... see what you think. Come in and try it ALL on! Call us if you're intrigued... we just love it all... and we can help you decide on something super-fun! These are Needle Nannie magnetic pieces... each features the artwork of With Thy Needle & Thread, Blackbird Designs, Country Cottage, Lizzie Kate or Little House Needleworks... in miniature. Use them as needle minders, refrigerator magnets, or something to mind your notes on the filing cabinet at work. You might even be able to cling them to your stitching lamp and hold a pair of scissors! They're magnets -- you can figure out a million uses for them! 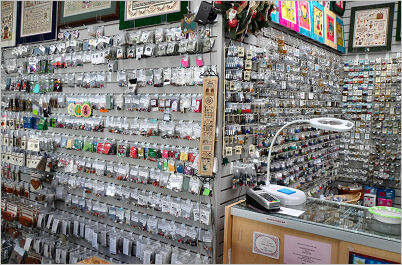 Just the best, because they bring your favorite bits of needlework anywhere you want them to be. Each measures approx 1-inch in diameter and features a pair of strong rare-earth magnets. Oh this is cool and very handy little thing! 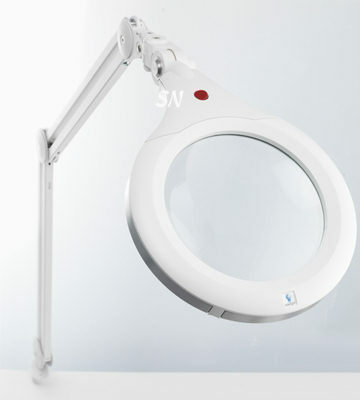 This is a LED-lighted personal magnifier. 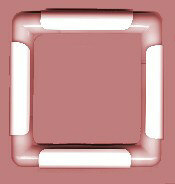 Simply press down on the metal rim, and inside... it lights up... to magnify your viewing field 5 times the size! 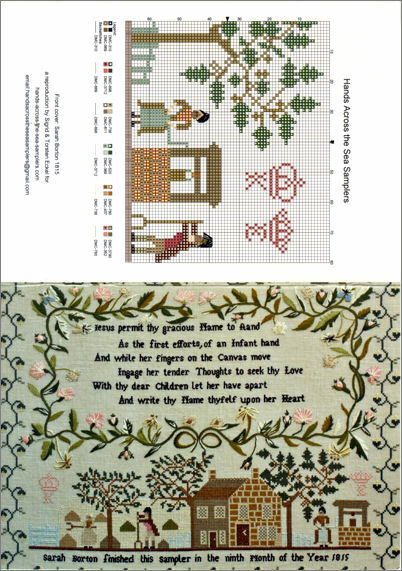 PERFECT to see needlework stitches, fabric threads, needlepoint stitch details, a stubborn knot... your instructions, a needle's eye, a sliver... ANYTHING you can't see right now! It is designed to sit on top of your project or paper, but you can hold it in your hand as well. REALLY REALLY NICE! It comes with a very stiff microfibre zip-closure protective carrying case, and a microfibre lens cleaning cloth (because my hubby turned mine off by pressing on the lens instead of the ring and leaving a nice big fingerprint!). It automatically turns off after 10 minutes in case you forgot about it... it's just the most wonderful thing for seeing stitch detail! Weighing less than 8 ounces, it measures 3-1/2 inches in diameter and stands1-3/4 inches tall. Dublin plugs into the wall... but also features a portable battery pack... that is NOT hidden way underneath in the hard-to-get-at base. Both the battery pack and the AC power adapter are also included. Super-compact... the box is a mere 10-1/2 x 15 x 4-1/4... the entire thing weighs only 7-1/2 pounds, and that 5-inch lens features the standard 1.75X magnification. The Dublin is super-duper loaded with great features, and those 21 LED lights will blow you away!!!! This is a WONDERFUL little lamp!!! Our second shipment has arrived and we are once again excited about this remarkable lamp! It has a weighted base, and plugs in to regular wall outlet. You can see on the arm bends halfway up for adjustment. 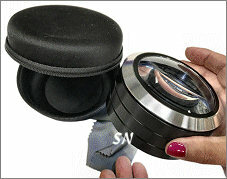 Then, where the lens meets the arm... THAT is a heavy-duty ball joint, so the lens swivels and turns *just how you want! * See the little flip-up lens cover? It stores safely in a sunny room, stays clean, and can't get scratched (by kitties or the cleaning lady) because the lens is covered when not in use. 4-Inch lens, 3-diopter magnification, with little 5X mag area. 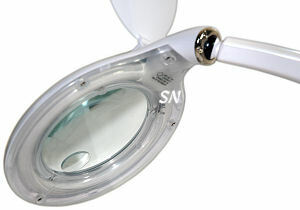 A WONDERFUL magnifying lamp option... once you try this... you'll never want to stitch under any other lamp again!!! Manufactured by Daylight Co, it features a light that is 'broad-spectrum' and delivers a true color that doesn't tease your eyes and confuse color. The best part, however, is the glass, 7-inch, 3-diopter (1.75x magnification) lens. Absolutely incredible to work with... the lens is bigger than the standard 5-inch. Because of the 7-inch size, the lens is curved less, so your view has less distortion. Available in white, the fully adjustable swing arm top features that wonderful light and lens, along with a fabric drawstring bag to cover and protect the lens, and a table clamp attachment. Absolutely wonderful... EVERYBODY has been so happy with this lamp... I'm pleased to recommend it to you! Please note: additional shipping charges may apply. Oh wow... this is a neat little light! It is LED and dims for 4 different light levels. It is SUPER lightweight, and comes as a table clamp, or stable standing light. (The floor version is due in at the end of May.) It has a cord... so not battery chargeable. What makes it really neat is the light design itself... it is two little 10-inch long 1-inch round sticks that spread apart in the middle, so you can direct your light where-ever you want! (My first thought is having it on your table at a class - and both you and your friend get a light!) The design is such that the light is directed down... not right in your face. The on/off switches are just touch buttons at the ends of the light sticks. The table version weighs just 1-3/4 lbs... (28 ounces) while the clamping one LESS THAN A POUND! The goose neck is covered in soft white plastic sheath, it looks so nice and smooth and clean. The clamp for that model is a SCREW clamp. It is not a pinch-grip thing... you don't have to squeeze it to death to get it to work. Right above the clamp base, you see a cylinder that is about 2 inches high... that is a 'screw'... so simply turn it to release the clamp, which can open as much as 2 inches! I really like this light... no magnifier, though. Lightweight, VERY packable, clean, white, daylight balanced light... really, really nice! 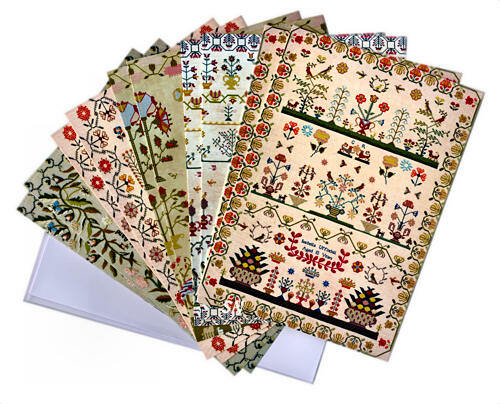 This is a set of 10 super-heavy-card-stock note cards that measure 6 x 8 inches each in size. Envelopes included for each, they feature images of antique samplers on their fronts, with a charted design from the sampler on the back of the card. PERFECT note cards for stitchers!!!! Blank inside, you get two each of 5 different samplers and their take-outs. LOVELY! I've been seeing this little guy for some time, and finally ordered some for the shop. What a pleasant surprise they are! Sudberry House delivers a 2-3/4 x 4 x 1-3/4 inch box (it kind of reminds us of a tiny manger) with a design area on top of 2-1/4 x 3-1/2! Almost an inch deep inside, you can finish the top -- and still have a tiny storage area underneath the pin cushion lid. I don't know what we'll put into ours yet -- probably a small Blackbird design... doesn't matter... this is just the cutest little thing! 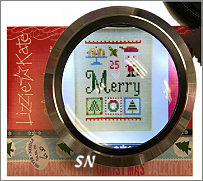 Look around for something small to stitch, the box/tray/(manger!) comes with the padded piece to mount needlework. These are SO cute... handmade of copper, nickel and brass, these magnets would be happy on your refrigerator OR your needlework -- keeping track of needles and threaders. Smaller companions to the Puffin's Thread Separators, each has a pair of those super-duper strong micro-mini magnets attached to their backside, so they perch anywhere a magnet can! They're approx 1 x 1-2 inches in size... very nicely done. Here are two small wooden cut-outs that mimic the shape of antique hornbooks, which were used in the olden days as an alternative to a textbook in school. Papers and lessons were attached to these little 'paddles', the handles tying to students belts and such, for easy transport to and from school. Stitch something small and mount onto these. You can have the handle at the top -- makes a cute area for an ornament hanger loop. You can have the handle at the bottom... and make a tiny sampler to display on it! They'd make fun tree ornaments, they're neat tucked inside a pretty sewing case. They'd be pretty framed in a needlework-themed shadow box... basically, there are tons of things you could do with these. No specific designs call for these... just find something cute in your stash! Tiny one measures 1 x 1. 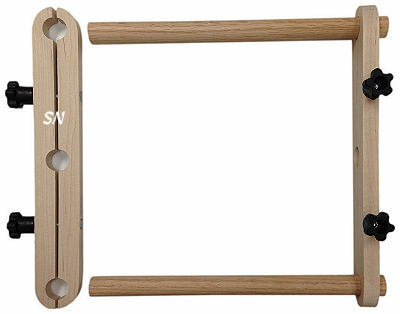 Small one's paddle area measures a mere 2-1/2 x 2-3/4, handle is another 1 inch. Larger hornbook measures 4-3/4 x 3-1/4, with a handle of 1-1/2 inches. Too darn cute! These sterling silver charms are the coolest! They are tiny silver stitches that are perfect on a necklace, charm bracelet, a sampler, a special stitching basket or needle case... just anywhere! So fun to collect, because they're affordable, and make great gifts for your stitching friends. We have a framed display in the shop, and have photographed them on our display to show you. Click the large image at right to see a full page of them. The images there are very close to the actual size! Kind of hard to decide on only one or two... so get a bunch! Maybe treat yourself to one a month??? These are new! 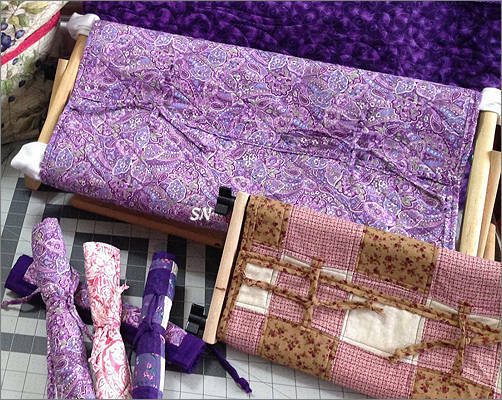 One of our friends, Shelly from TX is sewing pretty quilted covers for your WIPs (works-in-progress) that are already mounted on your scroll frame! 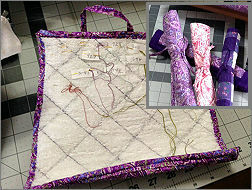 You pull your needlework in and out of your stitching bag all the time... but it's never really protected from damage. Ms Shelly has the answer! 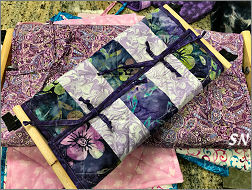 Pretty wraps... each is hand-sewn with quilted fabrics... assorted batiks and cute prints... they feature ties and are large enough to wrap around the bars of your scroll frame to COVER and PROTECT your stitching! Two sizes available - the small one is 13 inches wide, the large is 20. 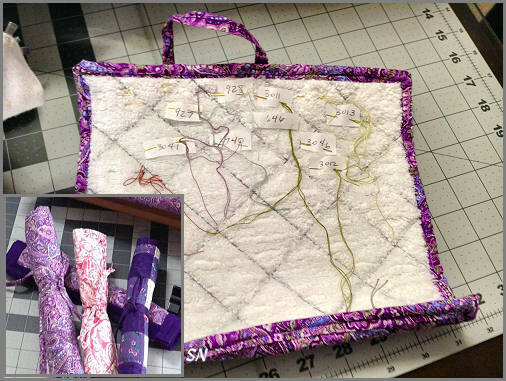 If your frame is smaller than 13 inches - fold over the edges, if you are working on something larger than 20 inches - at least this will cover most of your stitching area. Shelly is showing at the upcoming Market for the first time. We're so excited for her, and wanted to share her awesome products with you. So... Presenting Shelly and her awesome Wraps! Needle Rolls from Stitchy Shelly, Too! More function from Shelly, these are 9-inch-ish square mats to hold threaded needles and beads. Sewn of pretty fabrics (you can't see that side, sorry!) Shelly has lined each with flannel. When not in use, fold this over to close - like a checkbook. You can see her labels in there - thread numbers on them - with the threaded needles. The flannel keeps the threads from falling out of the needles and tangling... and you get all your threaded needles sorted there... all ready for the next stitch! Great for beads as well... spill a few on here... they'll stay put while you're using them in your project. Such a simple idea that makes stitching life so much easier!!! We are expecting our Stitchy Shelly Stuff right at Market time in a couple of weeks... she's let me introduce her things early, and we're thrilled! This is a wonderful new stitching frame hand-made by one of our customers, Julia, along with her brother! It is so simple, so uncluttered, and SO EASY to assemble and use! You get two side bars -- approx 3/4 x 2 x 14 in size. See the three holes? See the screws on them -- and the four little scalloped black finger knobs? You get 2 roller bars. Don't panic to learn that you use that blue painter's tape (it's low adhesive... and a sample piece is included with the frame) to attach the edge of your fabric to the bars. The bars fit into the holes of the side bars, you use the super-easy-to-grab scalloped knobs to tighten those bars around the rods... roll the bars to tighten... and you are ready to stitch! You can adjust your stitching area because of the holes on the sides, and you can even bring in your sides a little if you want. Actually very lightweight, the whole things weighs less than 1-1/2 pounds and it breaks down to the four sticks and knobs to fit into a cotton drawstring pouch (made by Julia's Mom, included.) Nice and smooth, NOT a messy contraption to use... easy to carry, I think you'll be very pleased with this! Cool little gadgets, Q-Snaps are INDISPENSIBLE! They are a very lightweight frame, designed to hold your needlework fabric tight, and straight on the grain...for neater and easier stitching. How many times have you run your Q-Snap clamps through the dishwasher to shrink them tight again??? Here are new clamps to make life easier! Replacements for broken or those loose-fitters, the 5-3/4 size fits your 8 x 8 frame sides and the 8-1/2 fits the 11-inch sides! Each package contains 2 clamps of the same size. Just something we've added to our gadget wall! Grime Guards for your Q-Snap Frame! 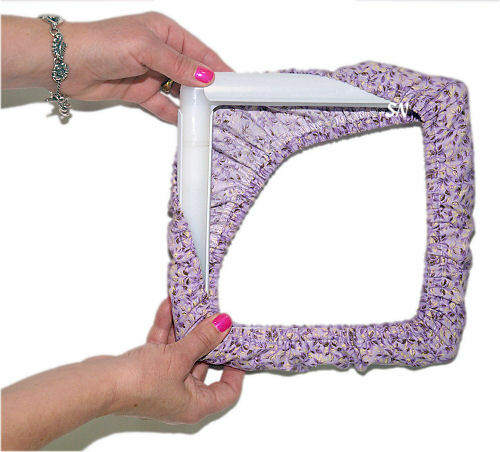 Kind of a handy little wrap, this is a simple, Plain-Jane blanket to wrap around your Q-Snap frame, to keep the fabric clean and tidy! Instead of handling your needlework fabric so much,and running the risk of soiling it, this little elastic fabric band just tucks around all... ZIP-ZAP! 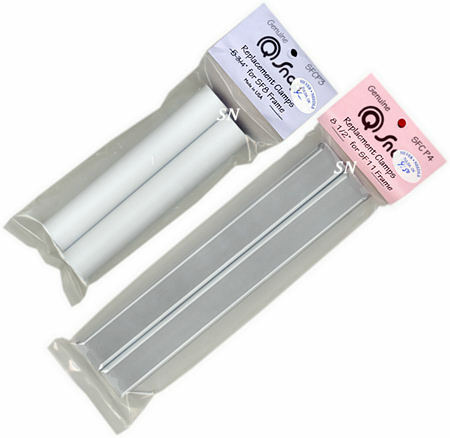 Offered in several different sizes to fit our most popular Q-Snap frame sizes, colors of cotton fabric vary. 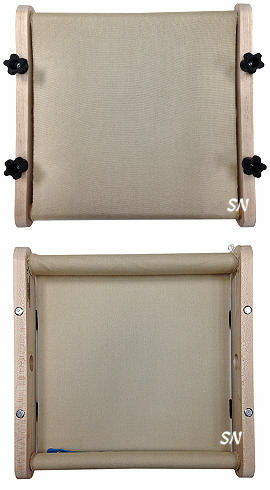 The 8 x 11 is not a packaged Q-Snap Frame size... you make that one by mixing your sides from the 8 and 11 inch frames. Make sure you see what we have on page 2, 3 and 4! 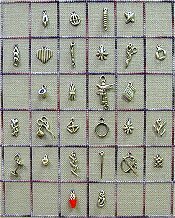 Sterling Silver miniature stitch charms, threaders, tweezers, beaded scissor fobs... Q-snap frames... just all sorts of things! In the interest of having the pages load faster for you, we've split our treasures onto two pages!